Let's get you ready to start the challenge! While this challenge is mainly designed to improve health habits, you'll likely have your own goals coming into these next six weeks and beyond. Being clear about your goals is important for long-term success and satisfaction with your lifestyle. Take a moment to think deeply about your goals and write them down somewhere (notebook/journal/note on your phone/etc). Learning to measure your progress is a great way to keep track of your hard work and give you objective references! The GTS Total Health Challenge is set-up for your to see how your health habits are improving from week-to-week, but you'll also benefit aesthetically via body fat loss and lean muscle gain. Having your kitchen stocked with nutritious foods is essential for your success in the challenge! If you build your refrigerator and pantry around lean protein and vegetables, you'll have a much easier time eating well when life gets busy. I recommend building in a base set of calories each day that include several servings of protein and vegetables. In the context of the challenge, fats should be used either for your flavoring or towards your flexible calories. I typically don’t recommend purchasing a lot of pure fat items as you'll tend to get a lot of trace fats from various protein rich foods. Fat calories will keep you satiated but are very calorically dense (9 calories per gram) so it’s easy to go overboard if you aren’t measuring and keeping track. For reasons related to general health, it's best to have most of your added fats come from monounsaturated fats (bolded). But, if you plan to drink, log it and count it toward your flexible calories! During this challenge we'll recommend you keep tabs on things like your body weight, waist measurement and progress pics. 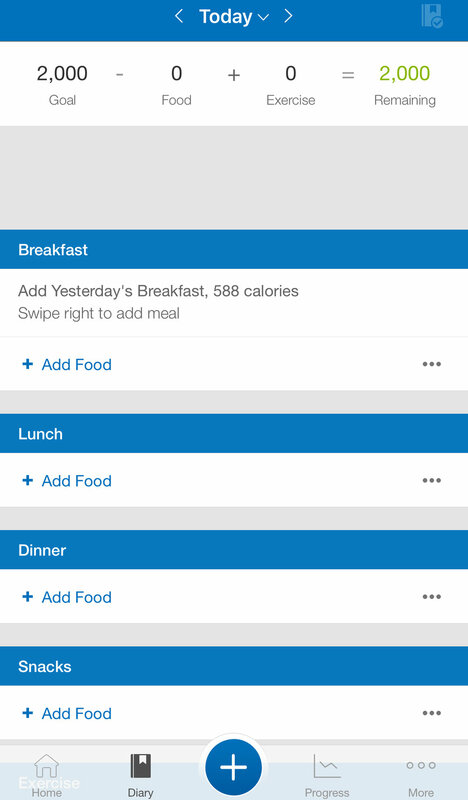 We recommend downloading a calorie tracker app like MyFitnesspal. It has a great system for tracking progress and it's FREE. In addition, while you're not required to log your calories for this challenge, a calorie tracker app can be a quick reference guide for helping you measure your daily flexible calories. If you're completely new to tracking your food, it's totally okay to start simple by keeping a food journal. Any notebook will do just fine. Simply write down everything you eat during the week! As you get more comfortable keeping track of your food, using an app like MyFitnessPal will help you be more accurate and precise with your tracking. While this challenge is designed to build and improve upon healthy habits, depending on your average daily calories fat loss can be a nice byproduct. We recommend weighing yourself 3 days per week, first thing in the morning, preferably around the same time. Get started logging your weight and progress photo right away. Taking a waist measurement is an easy and effective way to monitor whether you're losing fat or building muscle. One to three times per week, take a waist measurement first thing in the morning, on an empty stomach. Most tape measures will do the trick. MyoTape is a good option! 1. Feel for the highest point on your hip bone. 2. (optional) Mark that spot with a cosmetic pencil. 3. Pull the tape measure straight across and around your waist. 4. Breathe out. The tape measure should be snug, but not pinching or indenting your skin. 5. Record the number to nearest centimeter (cm) or inch (in). Digital food scale to measure the quantities of flexible calories and flavor enhancers. Glass containers or Tupperware like containers to store food. We'll be creating more content which we'll send out throughout the 6 weeks to keep things digestible.